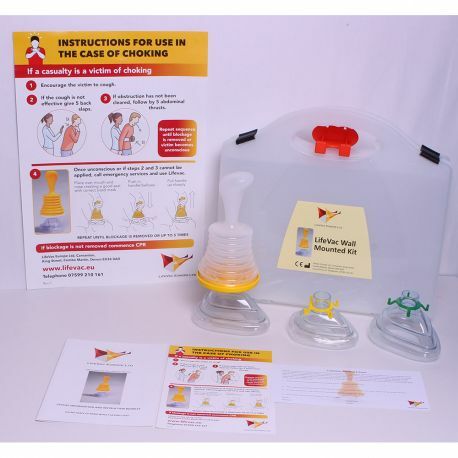 LifeVac is a non-powered single patient portable suction apparatus developed for resuscitating a choking victim when standard basic life support protocol has been followed without success. LifeVac is designed with a patented valve to prevent any air from exiting through the mask. This patented designed valve prevents air from pushing food or objects downward. This creates a one-way suction to remove the lodged food or object. The LifeVac wall mounted kit comes with its own wall mounting box to store the LifeVac Unit and the accessories as well as a wall mounting hook to hang the LifeVac kit in an area where choking is at a high risk. The A3 laminated poster makes it easy to locate in an emergency. It also details how and when to use LifeVac to save a life. The instruction booklet details how to use LifeVac and which coloured ring identifies the size of the mask. The Feedback form is to be filled out once your LifeVac is used to help us raise awareness and improve our service. Please enter your details below to request a bespoke quote for this product.